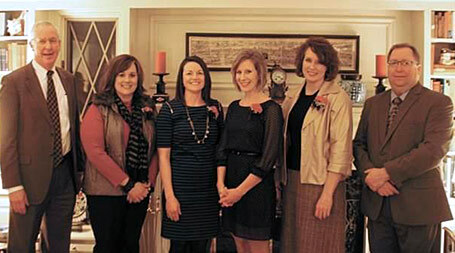 CAPTION (Above): The 2013 Teacher of the Year winner and nominees were recognized at Wednesday's Chillicothe Education Fund benefit. From left: CEF Board President Ed Douglas; nominees Jana Shira and Keri Rodenberg; Teacher of the Year recipient Billie McGraw; nominee Nancy Burtch; and R-2 Superintendent Dr. Roger Barnes. CAPTION (Below): The 2013 Beacon Award winner and nominees were recognized at Wednesday's CEF benefit. From left: CEF Board President Ed Douglas; Beacon Award recipient Dave Sheler; nominees Stacie Pauls and Terri May; and R-2 Superintendent Dr. Roger Barnes. The Chillicothe Education Foundation held its annual benefit dinner Wednesday night at the home of Ed Milbank (CEF Board member). The foundation raised over $16,000 at the benefit, which CEF President Ed Douglas said was normal. "It's been anywhere from $15,000 to $20,000 every year for the last 10 years," Douglas said. "(CEF programs) take every bit of that." For the past 16 years, the event has been held at Milbank's home, who also provides the food and beverages for the evening. Douglas said that the amount raised at the annual CEF-Milbank benefit makes up most of the foundation's funding. He added that annually, approximately $11,000 is spent on the Teacher of the Year awards, roughly $1,500 on the Beacon awards, around $4,000 on teacher mini-grants and nearly $2,500 on teacher recruitment. Some of the foundation's projects include Teacher of the Year awards, Beacon awards, mini-grants for classrooms, teacher recruitment and retention, student scholarships and fundraising for the construction of the new Jerry Litton Memorial stadium. The stadium was built on property the foundation purchased in 2003 for the purpose of school expansion, including 15.6 acres donated by the late Mr. and Mrs. CP Hutchinson and 45.6 acres that were purchased by the foundation. CAPTION: The Chillicothe Education Foundation awarded the 2013 Teacher of the Year and Beacon Award during a ceremony held Friday at the Gary Dickinson Performing Arts Center. Billie McGraw (left) was named the 2013 Teacher of the Year. Dave Sheler (right) was honored with the 2013 Beacon Award. 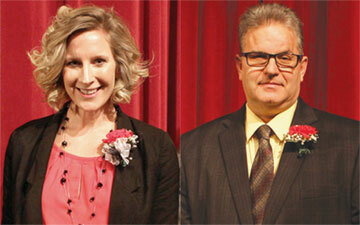 The Chillicothe Education Foundation awarded the 2013 Teacher of the Year and Beacon Award during a ceremony held Friday at the Gary Dickinson Performing Arts Center. The Teacher of the Year award was created 21 years ago to honor those educators who go above and beyond to promote educational excellence in the R-2 District. Charles Epps was the first winner of the award. Last year's recipient was Tim Riekena. Each school nominated one instructor for the Teacher of the Year award. Those nominees were: Linda Hauck, Dewey/Garrison; Billie McGraw, Field; Jana Shira, Central; Keri Rodenberg, Middle School; Pam Constant, High School; and Nancy Burtch, Grand River Technical School. This year's winner was Billie McGraw. Field Elementary's nominee said she was honored to have been chosen. "I get to work with a lot of teachers through so many different capacities," McGraw said. "I think we have many great teachers, so I feel very honored to have received this award." The Beacon Award was created six years ago to honor the non-teaching staff throughout the R-2 district. Gary Eide was the first winner of the award. Last year's recipient was Carla Meyers. Each school nominated one staff member for the Beacon Award. Those nominees were: Julie Chastain, Dewey/Garrison; Terri May, Field; Dave Sheler, Central; Stacie Pauls, CMS; Johnnie McClean, CHS; and Marla Harrington, GRTS. This year's award winner Dave Sheler. Sheler, a custodian at Central Elementary, said he was surprised to have won the award. "It was a nice honor," Sheler said. "The other nominees do a great job, as well. "It's a good feeling to know there are people that care about what you do and that they recognize it." Teacher of the Year and Beacon of the Year award nominees will be honored at a reception on January 29 at the home of Ed Milbank. Service pins were also awarded during Friday afternoon's ceremony. Those receiving 5-year pins included: Sonja Daley, GRTS; Brooke Leamer, CMS; Andrea Marriott, Dewey; Anne McKiddy, Dewey; Melanie Rucker, Central; Janet Abbey, CMS; Beverly Cordray, Bus Barn; Stacie Pauls, CMS; "Doe" Sperry, CHS; Inger Young, CMS; and Sarah Cavanah, CHS. Those receiving 10-year pins included: Pam Constant, CHS; Jenny Hughes, GRTS; Susan Mayers, GRTS; Leda Screiner, GRTS; Brenda Batson, Central; Yvonne Haslar, GRTS; Larry Jones, Bus Barn; Dennis Sturguess, Maintenance; and Marty Rogers. Those receiving 15-year pins included: Margie Albertson, Garrison; Kim Griffith, Garrison; Steve Haley, CMS; Jenny Hill, Field; Kim Kieffer, CHS; Angela Peterson, CHS; Jim Wheeler, CHS; Lisa BeVelle, GRTS; Nancy Hudgins, Bus Barn; Jennifer Jackson, Garrison; Carla Meyers, GRTS. Those receiving 20-year pins included: Pam Chapman, Field; Michael Harrington, GRTS; Linda Hauck, Dewey; Susan Keller, CMS; Nancy Nowland, Dewey; Ken Stull, CHS; Marla Harrington, GRTS; Mary Turner, Field; and Cynthia Foster, CHS. Two instructors received 25-year pins. They are Rusty Black, GRTS, and Jeanne Lair, CHS.